The harsh Australian climate can be brutal on our skin. And every who lives here, no matter what their skin type or colour, should attend an annual skin cancer check. 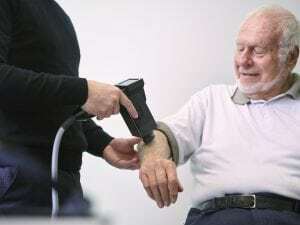 Melanoma, the most dangerous of skin cancers, is a fast moving, potentially fatal condition, one that you should be aware of and know how to take steps to prevent. Anyone living under the Australian sun is risk of developing melanoma. Basal and squamous cell carcinomas, while not as dangerous, still require identification, treatment and possibly removal. 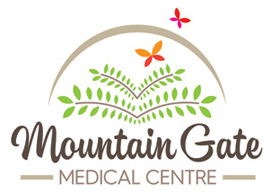 At Mountain Gate we use Molemax digital dermascopy to keep an eye on existing moles and lesions, recording any changes from year to year, alerting the Doctor immediately if there is need for further action. Our full body cancer checks take one hour and assess your own personal risk for skin cancer, based on family history, skin type and lifestyle. 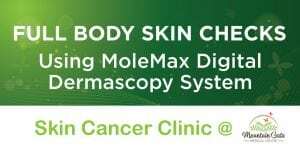 The session includes a full skin check using the Molemax system. All records are kept for comparison. We also teach you how to perform self-checks, and to keep an eye on moles or blemishes showing potential to become dangerous. Naturally we highly recommend the use of high factor suncreens and hats daily, and rash vests and sun shelters for anyone holidaying in the sun. If you’d like to book in for a thorough assessment, please contact us now on 03 9753 5677 to make an appointment. Please advise when you book that it’s for a skin cancer check.